Lately, we have been hearing about countless sequels being planned — and even written — before even the original movie is even released. You can add “Thor” and “Captain America” to that list, as it seems those movies have the production company’s confidence. We are now getting word that after the grand superhero collaboration movie “The Avengers,” Thor and Captain America will move on with their own sequels. And not only that, but Marvel has grand plans to spin off several other characters into their own movies. Thor will go off into a new adventure, and Captain America will continue to explore the modern world in another film of his own. We hope that holds true for the characters appearing in that film — Black Widow, Hawkeye and the spy organization S.H.I.E.L.D. — all of whom are more than worthy and capable of carrying their own films. And, we’ve got a lot of other characters we’re prepping and getting ready for film debuts: the world of martial arts, these great cosmic space fantasies, Dr. Strange, and the magic side of the Marvel Universe. There are many, many stories to be mined. Do you think any of this can change after the success or failure of “The Avengers?” If “The Avengers” makes a boatload of money, they will definitely push for a “Part 2.” But, for now, Marvel has their game plan and I admire them for that. What do you think? 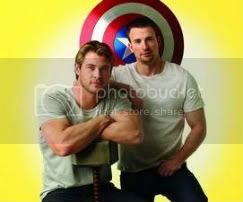 Both “Thor” (starring Chris Hemsworth) and “Captain America” (Chris Evans) will be released in 2011, with “Thor” up first May 6 and “Captain America: The First Avenger” following on July 22. I am a huge fan and therefor totally amped to hear that there will be more Marvel movies.